Today's featured name is a strong, handsome Irish name that I hand-picked from this week's blog about boy names that contain the letter V! 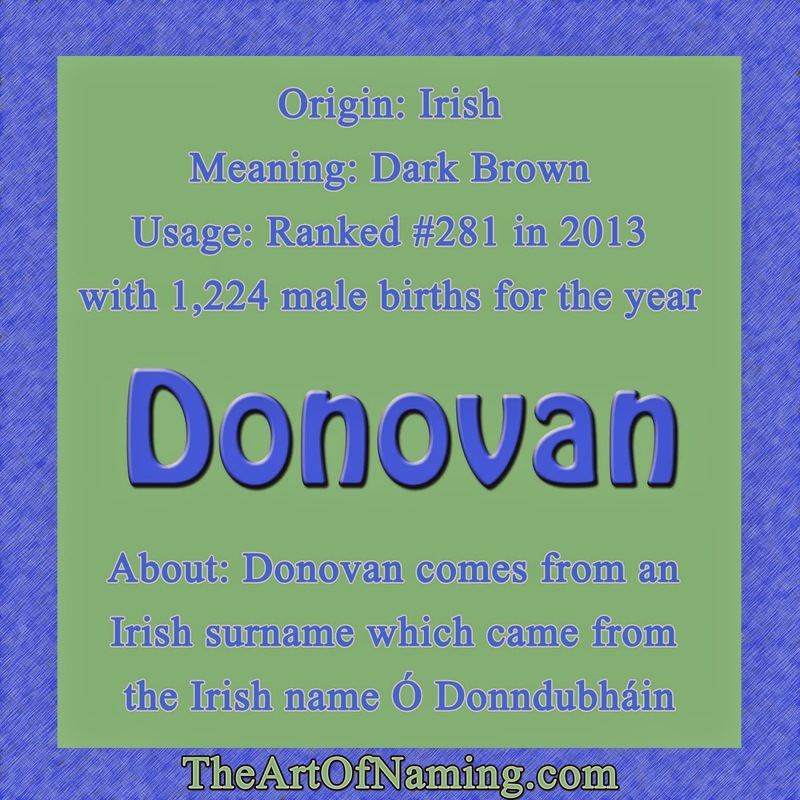 The masculine name Donovan comes from an Irish surname which ultimately came from the Irish Ó Donndubháin which means "descendent of Donndubhán". That name is basically Gaelic for "dark brown". Donovan has been in use in the US since 1900 and it has nearly always been in the Top 1000, save a few years early on. It peaked in 2003 with 2,210 births and a ranking of #176. Now in 2013, it has fallen to a respectable #281 with 1,224 births. It also ranks at #380 in France. Since this name is on the decline, it'll only become more and more unique. There probably isn't a danger of it sounding dated since it has been solidly established since 1900. It also wasn't incredibly popular. If it had peaked in the Top 50 and then immediately declined, it would be a different story. As it sits, it's still receiving good usage without being unusual or overly popular. As far as namesakes go, there is a Scottish singer songwriter named Donovan who was most popular in the 1960s. There are many famous people with Donovan as a surname and a handful with it as a first name. Take a look at the full list here.